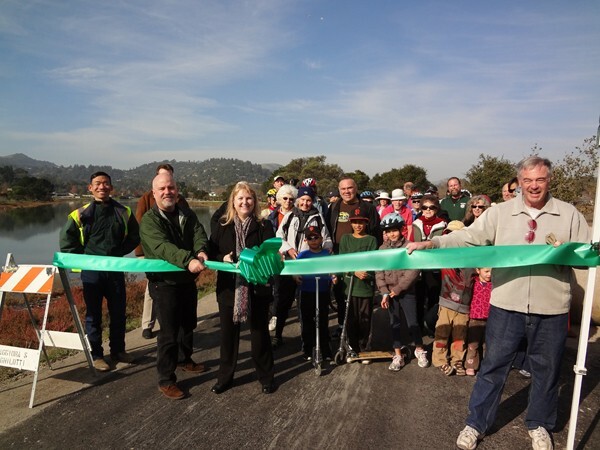 GREEN RIBBON Members of the RVSD open a new trail and sewer pipe along Corte Madera Creek in December 2011. After multiple grand jury reports on the dysfunction of the Central Marin Sanitation Agency (CMSA) and the Ross Valley Sanitary District (RVSD), the two sewage agencies are at it again. This time they're heading to legal arbitration over who gets to service San Quentin Prison and who should pay a budget gap of $800,000. The dispute has turned ugly, as the CMSA board removed RVSD board member Marcia Johnson from its finance committee at the end of March, alleging that Johnson called the other board members and the general manager names. "That never happened," said Johnson this week, disputing the charge. "I'm a grownup." Johnson believes, instead, that she's being forced out because she's asking questions about the San Quentin deal, and is pointing out how costs are being forced on to Ross Valley ratepayers. "It is a plot. I'm not just paranoid," Johnson added. The RVSD serves San Anselmo, Fairfax, Greenbrae, San Quentin and Larkspur, which it annexed in 1993. The district collects and delivers untreated sewage to the CMSA, a joint powers agency made up of the RVSD, the San Rafael Sanitation District and the Corte Madera Sanitary District. 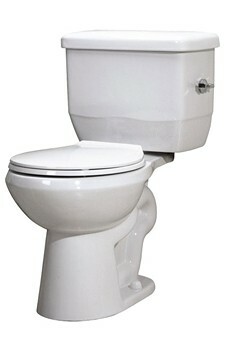 The CMSA, in turn, treats the sewage delivered from its member agencies. As a member of the CMSA, the Ross Valley district turns over about half of the rates it collects from residents to the treatment agency, says RVSD general manager Brett Richards. And, counting San Quentin and Larkspur, it accounts for about 54 percent of the CMSA's annual budget. The amount the CMSA charges the Ross Valley district is based on the number of equivalent dwelling units in the district: a house equals one equivalent dwelling unit, a 10-unit apartment building equals 10. In the spring of 2011, per standard yearly procedure, the RVSD notified the Central Marin district that it would have fewer equivalent dwelling units for the 2011–'12 fiscal year. Those 5,000 fewer units would have been a loss of about $800,000, says CMSA attorney Jack Govi. "Not having any idea where that was coming from, CMSA was really concerned," says Govi. The CMSA says it never got any clarity on the budget shortfall. So the agency adopted a new fiscal policy basing the annual budget on the last quarter of the previous year. That meant that the RVSD would pay for the dwelling units it had the previous year, even if it ended up with fewer in the upcoming year. At the end of the year, the member districts would be reimbursed, says Govi. "You can't charge us whatever you want," says Richards. The decrease in the RVSD's expected dwelling units was a result of a decrease in the amount charged to San Quentin. After testing the sewage released from the prison, it was determined to be less polluted than previously thought, and therefore cost less to treat. Richards says he approached San Quentin in the fall of 2010 about decreasing its rates. But, Govi says, the prison came to the CMSA in the spring of 2011 after finding out it was paying $1.7 million for maintenance of a pump station. CMSA general manager Jason Dow told the prison that the agency could provide that same service for $100,000. Govi says that upon seeing that figure the prison asked for a more in-depth service proposal. The RVSD disagrees with that telling of the story, but is adamant that the CMSA can't take its business. San Quentin pays the Ross Valley district about $2 million per year, says Richards, approximately $900,000 of which is handed over to the CMSA. "They're stealing San Quentin from us," says Johnson. In April, the CMSA board voted on a contract to provide all wastewater collection services to San Quentin for a flat fee of $100,000 per month. The contract vote failed in a 3–3 tie. Johnson says one of the issues was that rates must be determined by usage, not flat fees. The other problem, she says, is that the CMSA is in violation of the terms that created the agency in the first place—terms saying it will only serve its member agencies and not perform services outside its boundaries. Additionally, says Richards, the transportation of the sewage from San Quentin to the CMSA would be through pipes that are actually owned by the Ross Valley district. "It would be like me telling my neighbor he could use your car," says Richards. That argument will be added to the list of issues to be arbitrated by the two agencies in the coming months. As Mary Sylla, a candidate running for the RVSD board, has pointed out, residents are paying for the lawyers on both sides.